This stand of onion plants are infected by Iris yellow spot virus. 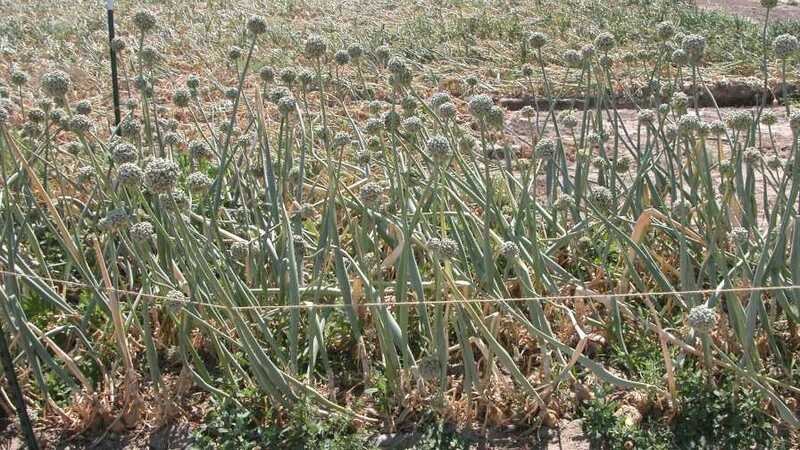 USDA grant-funded research at Washington State University is helping find sustainable ways to protect allium crops and more from pests and diseases. Two national research teams led by scientists at Washington State University (WSU) are on a mission to protect U.S. grape, onion, and garlic crops from deadly, fast-adapting pests and diseases. And thanks to more than $5 million in Specialty Crop Research Initiative (SCRI) grants from USDA’s National Institute of Food and Agriculture, they are off and running. Hanu Pappu, the Chuey Endowed Chair and Samuel H. Smith Distinguished Professor in the WSU Department of Plant Pathology, received $3.29 million to study and stop serious pests and diseases harming onions and garlic. Add to that, Michelle Moyer, Associate Professor with the WSU Viticulture and Enology program, received an initial $2.4 million to launch a national effort to understand and combat fungicide resistance threatening the highly valuable wine, table grape, and raisin crop. SCRI funding will support four years of research, and three separate research components, spearheaded by WSU, USDA’s Agricultural Research Service (ARS), New Mexico State University, Oregon State University, Cornell University, College of Idaho, and University of California’s Division of Agriculture and Natural Resources. The diverse team is aiming to develop economical, environmentally sound, and socially acceptable integrated pest management tactics to control pests and the diseases they carry, Pappu confirms. Scientists will work to reduce pesticide use to control thrips, while developing crop varieties that are resistant to the pest and the destructive virus they carry, Iris yellow spot virus (IYSV). 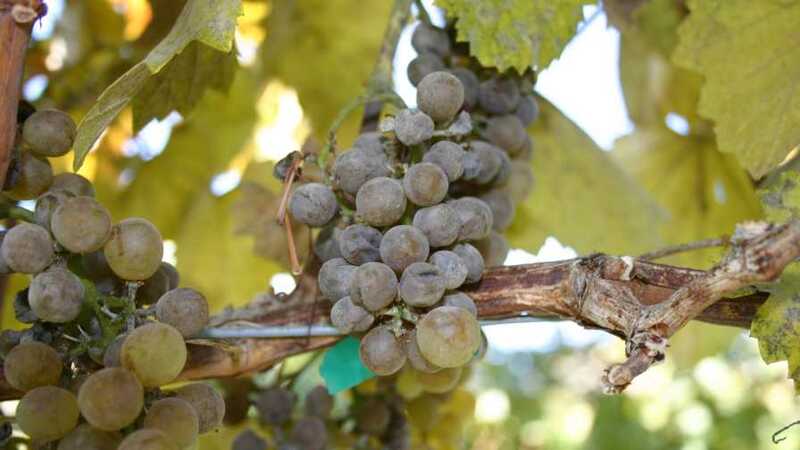 Powdery mildew, a fungal disease that harms grapes, is becoming resistant to effective fungicides. Washington State University researchers are leading a four-year project to stop resistance. 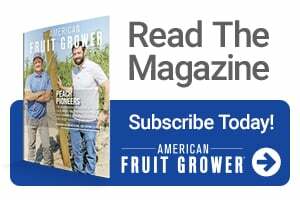 For decades, grape growers have relied on inexpensive, effective fungicides to prevent millions of dollars in crop losses from powdery mildew. This fall, Moyer is launching a four-year, $4.75 million, multi-institution effort to reduce the impact of resistance, titled “Fungicide Resistance Assessment, Mitigation, and Extension Network for Wine, Table and Raisin Grapes” (aka, FRAME). In collaboration with Michigan State University, USDA-ARS; Ohio State University; University of Utah; University of California, Davis; University of Georgia; and University of California Cooperative Extension, the FRAME team will improve how to detect and predict resistance as well as develop strategies that help growers, Extension educators, and manufacturers reduce its economic impact. According to WSU, molecular biologists on the team will help create better, faster tests for resistance. Extension specialists will develop service centers in grape regions around the U.S., helping to put new resistance tests into practice. Engineers are charged to model resistance hot spots and the rate of fungus spread, using local weather and topography. Viticulturists and field pathologists will then evaluate management strategies in the vineyard. Moyer is expecting that once the process is perfected, the FRAME concept could be expanded to many specialty crops, from apples and cherries to hops and potatoes.